The other ting in these photos and footage is the lack of stars . Coincidentally a lot of sci fi programs also seem to over look them. I have my own theories of this . They say that due to the brightness of the moon the camera settings required to photograph the moon won’t show the stars just like taking a pic here on earth on a day with a clear sky you won't see the stars even though they are always there. This seems feasible to me, it's hopeless trying to star gaze with a telescope on a full moon due to light pollution from the moon & you also need a very tinted filter to look at the moon with a half way decent telescope because its so bright. Yes i can relate to that about the light , but what makes our sky blue. If they land on the moon during the day, say, and they are not supposed to be protected with an atmosphere they are in a direct sun rays with no protection.how can this be . if they were to land on the very edge of the sun line , perhaps it would be dramatically reduced , i suppose! none the less, if the is no atmosphere, there is nowhere for the stars to reflect through so there for they would not be visible . we only see them because the light is captured by the atmosphere and our eyes can see the reflection . Like a rainbow . do we see a rainbow or the reflection of light captured by the fine rain . No atmosphere no stars . To travel in space out outside of our atmosphere there would be no stars at least visually. Only solid matter like planets , moons etc.would be seen. 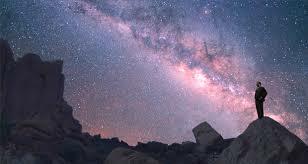 The sky is blue because of our atmosphere, it makes stars twinkle, but they would be much clearer without an atmosphere, which is why the best observatories are high up on mountains so they have less air in the way. Observatories are in the places they are to avoid pollution and also light pollution. The moon photos are contradictory, in one hand we wonder if they were even true. We wonder if photo shop was applied to them. and on the other we wonder how they can be there without atmosphere to protect them knowing well that there suits are not protective of radiation , which strangely suggests that there is an atmosphere on the moon.